The number of foreign nationals (refers to foreign defendants; hereinafter the same in this subsection) convicted in the court of first instance (limited to district courts and summary courts; hereinafter the same in this subsection) in 2008 was 5,676 (down 18.8% from the previous year), and the percentage among total persons convicted was 7.4% (Source: Annual Report of Judicial Statistics). The number of persons in cases requiring interpreters (refers to foreign national cases in which defendants are accompanied by interpreters/translators; hereinafter the same in this subsection) finally disposed in 2008 was 4,511 (down 21.8% from the previous year). As many as 38 different languages were used in those interpretations. Of them Chinese was used the most frequently at 1,305 persons (28.9%), followed by Korean at 544 (12.1%), Tagalog at 523 (11.6%), Portuguese at 393 (8.7%), and Spanish at 282 (6.3%) (Source: The General Secretariat, Supreme Court). Fig. 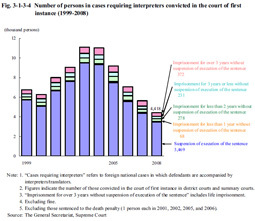 3-1-3-4 shows the number of persons in cases requiring interpreters convicted (limited to those sentenced to imprisonment with or without work; hereinafter the same in this subsection) in the court of first instance over the last 10 years. The number has been decreasing from 2004 and was 4,418 (of which 4 were sentenced to life imprisonment) in 2008. The suspended execution rate was remarkably high at 78.6% when compared to that of cases involving Japanese only (58.7%). This is due to the fact that the suspended execution rate for Immigration Control Act violations in cases requiring interpreters was significantly high at 91.7%. The suspended execution rate of cases requiring interpreters but excluding Immigration Control Act violations was 68.8% (Source: The General Secretariat, Supreme Court).